Fed Up! Bernanke (Gently) Takes On Critics : It's All Politics Bernanke said the Fed's $600 billion Treasury bond buywas just another way to do what the Fed does when it lowers key interest rates. The alternative, he said, was to risk more unemployment and economic woes in the U.S. and eventually the world. Federal Reserve Board Chairman Bernanke explained why he's right and his critics wrong in speeches (this speech is the more important one, this one less so) he delivered Friday defending the U.S. central bank's controversial efforts to further jolt the sluggish U.S. economy. Responding to criticism both domestic (congressional Republicans, Sarah Palin etc) and foreign (China, Germany), Bernanke explained that the Fed acted to further stimulate the economy by purchasing $600 billion in Treasury bills because it beat the alternative. As Bernanke and other Fed officials see it, that alternative would likely condemn millions of added Americans to seemingly endless unemployment and underemployment and the U.S. economy to the doldrums far into the future. 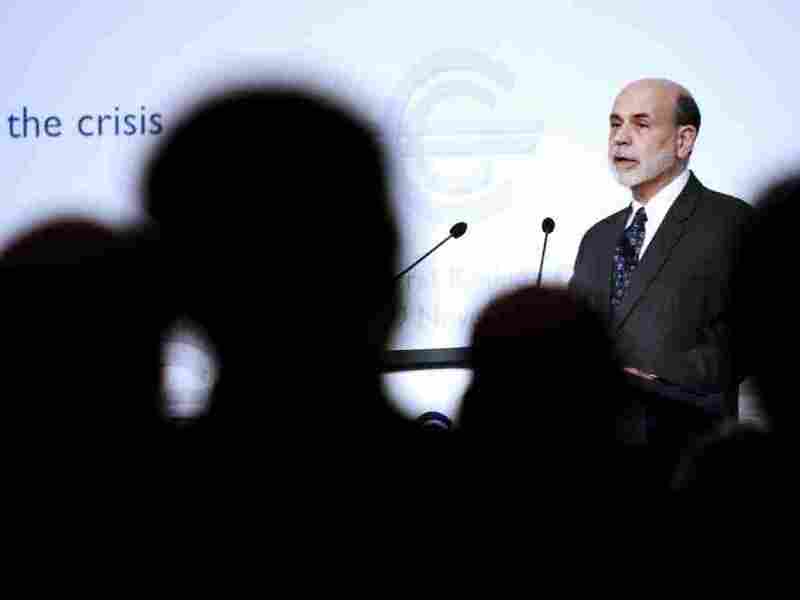 But his speeches at a meeting of central bankers in Frankfurt, Germany weren't only a defense of the Fed's actions. He also criticized, though politely, China and other developing nations for keeping their currencies artificially low. Bernanke argued that while China and other developing economies benefit in the short term through such practices by making their exports more affordable, over the long-term their actions weaken the U.S. and other advanced economies China relies on to consume all those products made in its factories. In short, China is shooting itself in its economic foot. Bernanke also said people need to keep in mind a related point. The developing economies are growing much faster than advanced ones in what he called a "two-speed recovery." So the worries in developing economies (inflation) are going to be different that those in the advanced ones (stagnation). Those differing concerns will require different policies. So while China, say, might want to raise its interest rates to fight inflation, the U.S. may need to lower its rates which might have the spin-off effect of making the dollar weaker. But so it goes. Getting back to the need for the Treasury bond purchases that have set his critics' hair on fire, Bernanke explained not only why in his view it was necessary but that it shouldn't even be called "quantitative easing." That latter point is really technical and most people won't care what it's called. Suffice it to say that Bernanke thinks we've all been using the wrong name for what the Fed's been doing. More important is the bigger picture. In Bernanke's view, it's all about forcing long-term interest rates as low as they can go while keeping a wary eye on inflation signals to make available as much money as possible in the real economy. It's all about trying to boost confidence and get people buying things again. The Fed has exhausted the usual way it would open the money taps, by lowering key interest rates like the Federal Funds rate which is already effectively near zero. Meanwhile, it doesn't see signs of dangerous inflation. What it sees are signs of the even more dangerous deflation when prices fall. It's more dangerous because while governments have tools to fight inflation (higher interest rates) they're more limited in fighting deflation. In any event, the Fed is trying to put downward pressure on long-term rates by using a different method, that's all, he patiently explained. Because the interest rate on Treasury bonds moves in the opposite direction of the price of those bonds, buying up bonds increases their price (that's the law of supply and demand at work) and lowers their rates. That, in turn, causes other long-term rates, like mortgages to fall. And it forces some investors looking for a better return on their money to put it into something else, like maybe a company that wants to expand. At least, that's the hope. Let me address the case of the United States specifically. As I described, the U.S. unemployment rate is high and, given the slow pace of economic growth, likely to remain so for some time. Indeed, although I expect that growth will pick up and unemployment will decline somewhat next year, we cannot rule out the possibility that unemployment might rise further in the near term, creating added risks for the recovery. Inflation has declined noticeably since the business cycle peak, and further disinflation could hinder the recovery. In particular, with shorter-term nominal interest rates close to zero, declines in actual and expected inflation imply both higher realized and expected real interest rates, creating further drags on growth. In light of the significant risks to the economic recovery, to the health of the labor market, and to price stability, the FOMC decided that additional policy support was warranted. This policy tool will be used in a manner that is measured and responsive to economic conditions. In particular, the Committee stated that it would review its asset-purchase program regularly in light of incoming information and would adjust the program as needed to meet its objectives. Importantly, the Committee remains unwaveringly committed to price stability and does not seek inflation above the level of 2 percent or a bit less that most FOMC participants see as consistent with the Federal Reserve's mandate. At the end of this section of the speech, he essentially said the Fed has done what it can do using monetary policy. The economy needs Congress to do more on the fiscal side to boost the economy to a higher growth rate, he said. In sum, on its current economic trajectory the United States runs the risk of seeing millions of workers unemployed or underemployed for many years. As a society, we should find that outcome unacceptable. Monetary policy is working in support of both economic recovery and price stability, but there are limits to what can be achieved by the central bank alone. The Federal Reserve is nonpartisan and does not make recommendations regarding specific tax and spending programs. However, in general terms, a fiscal program that combines near-term measures to enhance growth with strong, confidence-inducing steps to reduce longer-term structural deficits would be an important complement to the policies of the Federal Reserve. Here's a snippet of his message to China and other developing economies that they need to worry about ultimately harming the global economy by keeping their currencies artificially low. ... As I have described, currency undervaluation inhibits necessary macroeconomic adjustments and creates challenges for policymakers in both advanced and emerging market economies. Globally, both growth and trade are unbalanced, as reflected in the two-speed recovery and in persistent current account surpluses and deficits. Neither situation is sustainable. Because a strong expansion in the emerging market economies will ultimately depend on a recovery in the more advanced economies, this pattern of two-speed growth might very well be resolved in favor of slow growth for everyone if the recovery in the advanced economies falls short. Likewise, large and persistent imbalances in current accounts represent a growing financial and economic risk. In the end, Bernanke says the world needs some kind of global monetary "mechanism" to help sort things out when some economies like China build up huge trade surpluses and others huge trade surpluses. That was the "I have a dream" part of Bernanke's speech in which he left the audience of central bankers a challenge to chew on.